You know when you are roasting your potatoes for dinner (because inevitably I’m doing some kind of meat with 3 veg scenario) and then you know you have to cook some other bits but you would rather poke yourself in the eye than do that? I have a solution! 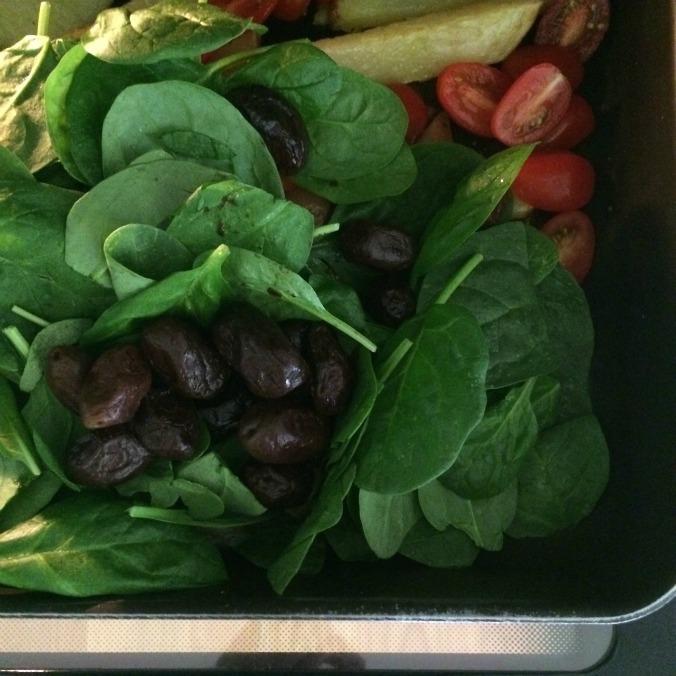 Then I got a punnet of cherry toms, cut them in half, threw in a big handful of baby spinach and a handful of olives and whacked them back in the oven for a few more minutes. ONE pan. 5 minutes later I had ALL OF THE SIDES done. Actually, I added some haloumi because: haloumi and we were good to go. Got a dinner hack for me? Is there anything better than a one pot wonder? Genius! A variation of this is one of my family’s favourite dinners. Roast potatoes and whatever else is lying around the fridge, then I lay the lamb on top of everything else for last 10-15 mins, turn once and turn the grill on for the last five minutes. Lamb juices soak into everything else making an amazing sauce. 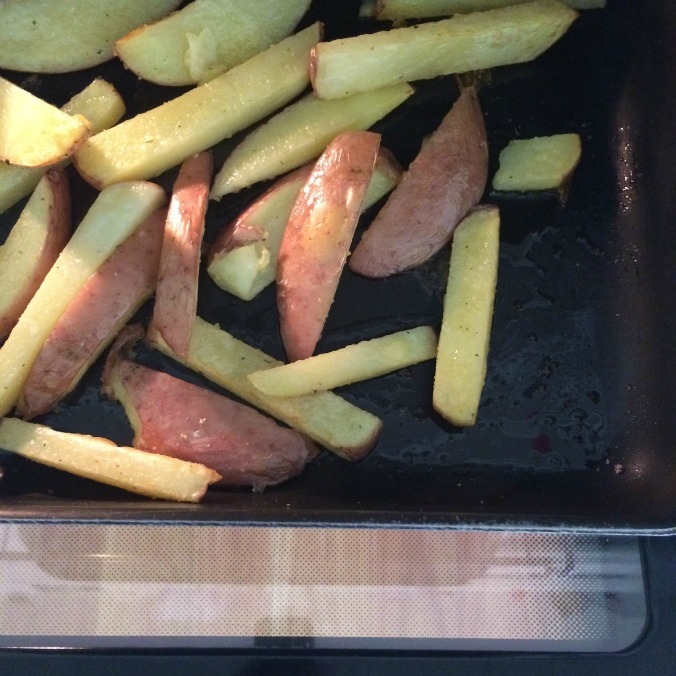 Potatoes turn out a bit mushy rather than crispy but it’s all sooooo good and the magic one pan to wash up. If there’s anything better than a one pot wonder, I’m yet to find it. And yes, haloumi at every meal Beth! Awesome Hack! Nothing better than one pot. I am sadly lacking in the one pot wonder department. Haloumi… always Haloumi!! You have inspired dinner tonight! Thank you! Love this idea! I sometimes do a mixed roasted root vegetables in one pan- potato, carrot, parsnip, sweet potato, onion and garlic ( also,used beetroot, very nice). Chop all up in smallish pieces, toss in lots of olive oil salt and pepper and any herbs you like. Then roast in a hot oven till done to your liking. Very easy and very yummy. Great for large groups. Oooh where do I find that? Just in the spice part of the supermarket? Will check it out for sure. Thanks! good to go alright with the one pot wonders beth! … I try it all the time! Yes!! 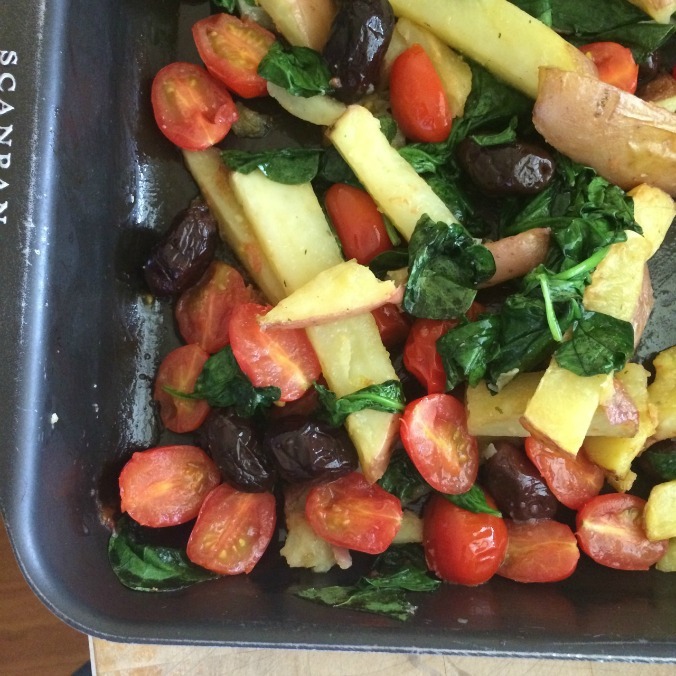 “Everything in one pan” is my favourite meal, Beth, and this one looks the business. Any way in which I can incorporate my laziness…I mean time-saving prowess, ahem, into the nightly meal makes me very happy indeed. Well, now I’m hungry. Yum. Well, I’m always hungry these days. My meal hack is to roast twice as many veg as you need. Whack in the freezer. When you cannot be asked to make dinner, defrost in microwave. Fry some onion and garlic in a saucepan, whack in the roast veg, and cover with stock. Boil the heck out for 5 min and the puree. Soup. Stir some cream in if you want to be all posh like! That is a VERY good hack! By far my favourite food hack. I discovered this not too long ago and it is sooooo satisfying! Haloumi is my bestie right now. My favourite dinner hack? On some foil put some cut up greens (either asparagus, broccoli, zucchini, brands.) top with halved cherry toms. Mix up some EVOO, crushed garlic, S&P then drizzle over veg. Top with a fillet of thick white fish, wrap up and plonk in the oven for 20 mins. Serve and drizzle over the juices. An individual whole meal in one packet. I do an “all in” baked dinner. Veggies cut into chunks, with olive oil and herbs tossed through. I love a good root veg so we’ve usually got potatoes, pumpkin, zucchini and red onions in it, plus whatever else is floating around. Cook it for 30-40 mins then throw your favourite (snags, chops, chook bits, whatevs) meat on top. Cook until meat is done. Serve, eat. Yum, no mess and so quick and easy to make that you barely even bother to sigh when one of the kids turns their nose up at it. You rock my world. I’m still punching the air about roasting broccoli. This is the business! Sweet! I’m totally stealing this thanks so much!! Our family fav dinner is salmon (waxy spuds unpeeled sliced into super thin circles, top with skinless salmon fillet, asparagus or broccolini, a few knobs of butter, grated lemon zest and juice, chives and a squeeze of lemon juice, S&P, chilli for the grown ups. Wrap each piece of salmon and veg into a parcel in baking paper. Bake for about 30 mins @ 180! !